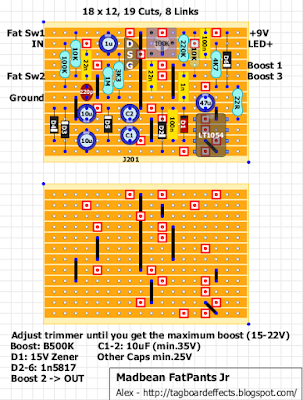 Guitar FX Layouts: Madbean FatPants Jr.
Madbean's 2015 version of his FatPants boost. No videos available at the moment. for some reason comments aren't posting, but I just ordered and built this PCB from madbean. I couldn't find a 1054, but I went with the 1044, jumpered pins 1 and 8 and used a 9.1 zener. It was the current one for sale on the 1590A section of his shop. Do I see a FET there? What FET is recommended? 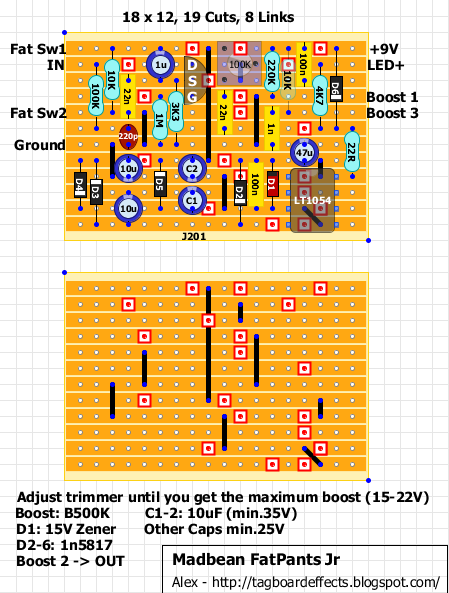 By the way - this looks like a nice project and the demos of other FatPants pedals sound really good. They don't have the JR. but they say most versions are similar. This one has the charge pump. You can also use an ICL7660s or MAX1044 for a charge pump, pretty much interchangeably. As usual with Madbean projects, it is worth looking on their site for the build documents, which usually provide a lot of help. They use a J201 in this build. Is there a sub for the 15v zener? Thnx!